Taking the time to put into words about my paintings, faith, and thoughts that motivate my work and inspire me and others. The year of 2018 was great in a lot of respects for me as an artist and a person. It was great in activity in making paintings. Great in putting together a web store. Great in new relationships connected with my artwork. Great in desires and expectations. Great in learning from my failures. I confess that I thought I would have more sales of my prints and gain a few more commission works to do. But, my personal growth, spiritual growth, and business growth don’t always grow together equally. One of the aspects of the business for C Irwin Design was that I wanted to have the ability to serve or give back to others. To create inspiration, not just with my paintings, but with helping financially, physically, and emotional needs of others and bless their efforts. The original heart felt desire I had was to give fifty percent of my profits to those I know who need help. Whether a mortgage payment or a shelter in Baltimore city, I wanted this to be more than just about my art. I’m not quite there, but the 2018 year was the first time I was able to give out of my ability and business. The first of two banners that Dave and Susan presented. Inspiring hope to others in Cuba from America. Last November, a medical team went to Cuba to help teach, encourage, and support those families with autism. My friends, Dr. Dave and Susan Madder, were a part of that team. Just before they left I was able to create a banner that they wanted to leave with the Cuban people for encouragement and love. I look back and think “what if I didn’t make that rainbow”? What if I said “nah, go with another ideal”. 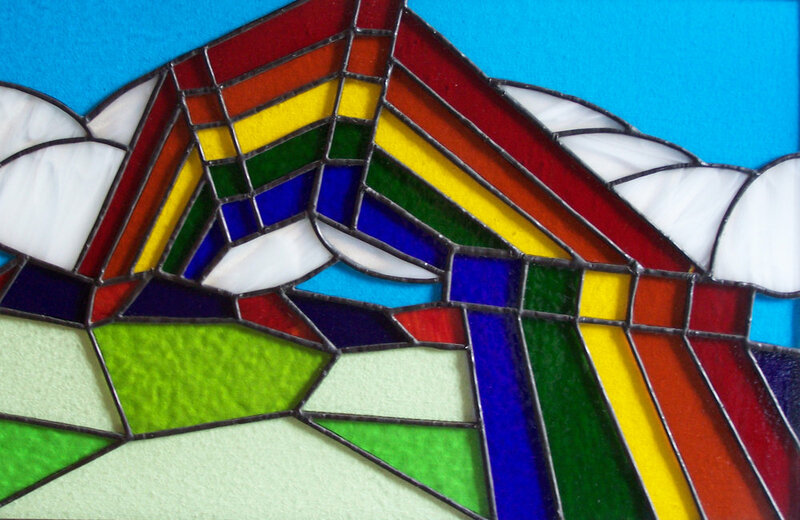 That year I remember being inspired to do religious stained glass and to do a series from Bible stories. I realize that sometimes the things I do aren’t really for me. My creative talents are to be used for good today and also for the future tomorrow’s that I don’t know yet. The blessing of future Cuban families that I didn’t know 26 years ago. It is a huge passion of mine to help other creatives with learning’s I have had over the last 25 years of being an artist, entrepreneur, father and husband. It is a passion of mine to help point others to answers and keys to unlocking their creativity and allowing the good stuff to flourish. I cannot tell you how many times I have run into artists, authors, and creatives that have amazing Ideas but little action. Have you ever found yourself building lists but spending more time on lists than on producing the product or goods? For every 1,000 dreamers and “thinkers” there are about 10 actual “do-ers”. Procrastination or the art of putting off until a later time is usually fueled by fear. Fear of failure, fear of looking stupid, fear of criticism, fear that it will take too long, fear that it is a waste of time. Nike coined the phrase “just do it” and it fits appropriately. Overcoming your fear and doing it requires risk and willingness to fail. 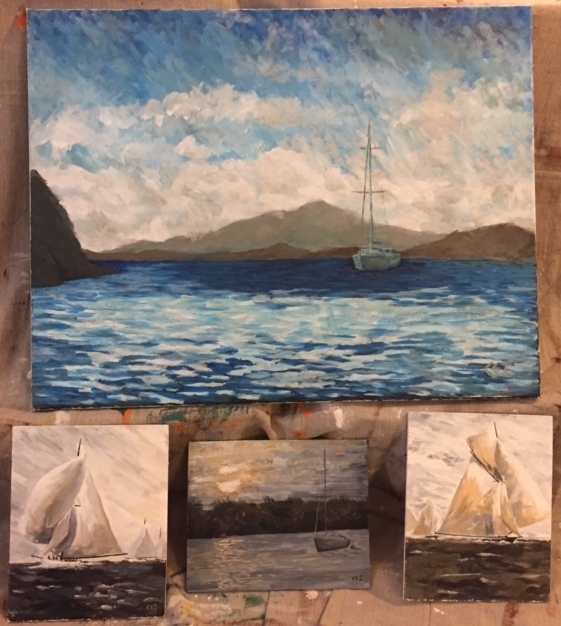 When I started my company I remember the feelings of fear as I attempted new techniques, new sizes of canvas, new audiences, new clients and new ideas. The driver was I had to eat. To eat meant that I needed to sell. In order to sell it needed to be fresh and new and different. New and fresh and different means: Risk and nothing that looks the same as the rest of the field. For every time that I have succeeded, I have failed at least five or more times. Willingness to fail is the key to overcoming procrastination and embracing results, newness, and success in your craft. You have to get to the point of realizing that it might not be perfect and it might not be what others want or might fail. However, the key is that you “DID” it. I have learned more about myself by pushing and doing what I don’t feel like doing that it has become a part of me. Let me explain: 80% of my life is what I don’t “feel” like doing: Working out, saying no to certain foods, taxes, taking the trash out etc. The other 20% is what comes naturally and is second nature because I have created a discipline and now I like it. During the summer of 1992 My wife Diane and went to the Middle East. It was our thought that we might become missionaries overseas and we decided to take a test run as "tourists". We went with an organization that was familiar to us and planned to be away for three weeks. It was a great experience and a challenge for us as individuals and as a couple. We were in a large city and one of the nights Diane and I stayed late at a friends apartment. It was on one end of the city and our apartment was at the other end. Sometime after midnight we were able to get a taxi and headed back. Once we got back to our place it was customary to add a tip to the fair and I gave what I had which was an extra five dollars in my pocket. I handed the fair to the driver with the five and he was ecstatic. Speaking with excited joy, the driver with his broken English wanted to take us out for drinks and food to celebrate the wonderful tip I gave him. What I didn't understand at that moment was the five dollars equaled about five months of pay. Back home Diane and I had part time jobs, a single car, rented an apartment, and I was still going through college. the five dollars would have bought a McDonald's meal in America. For the taxi driver it was worth much more. This year I have family that are planning on going overseas to work in an orphanage and other projects in Africa. Part of going on a trip like that is to raise funds to cover the costs and help who you are going to help. I wanted to give what I had so reached into my pocket and I had my artwork. My desire was to sell some art and use part of the proceeds to help fund the trip. I realize I can be creative in making paintings as well as helping others who are in need. I just had to reach into my pocket. I can't find it. I've made two attempts. The second attempted was more thorough. I was looking under the couch. I looked under the storage trunk and cabinets of my art supplies. I pulled up my drop cloth I use for painting. I am on my knees crawling and looking and I can't find it. I can't find my plastic pallet knife. I was very happy with that plastic pallet knife because it performed the way I wanted. The size of the knife end was practically perfect and the flexibility of the handle made it easy to use. It would hold the right amount of paint for me to swipe a path on the canvas to get the stucco look that I wanted. This was important for the effect I was trying to accomplish on the flags I'm painting for the next series, SIGNALS. But... its gone. I have other pallet knives and some that are better made. I guess I can use another and I have tried. It just doesn't feel right or the same. I have become emotionally attached to my plastic pallet knife. A couple of days ago I went to buy another. this plastic pallet knife came in a pack of six and cost 3 bucks. So, it cost about .25 cents to make? But I couldn't do it. It was on principle, loyalty, and being cheap that I didn't buy the pack. I know it is still in the area where I paint. "I will find you my plastic pallet knife!". My surgeries; push ups; sit ups; watching a comedy like Jack Black in Nacho Libra (one of my favorites); playing with my dog Mistletoe; weeding in my garden; picking fresh tomatoes off my vines; fixing my sink; praying. I end up down on my knees more often then I think. a necessary humble position to live and get things done. I just need to be willing to get down when getting down is needed. I will find you my plastic pallet knife, I will find you. There are times when I sit down at the computer to read or watch the news and I see stories that are disheartening. It can be tragic, broken, and scary. Wondering what I could and would do sometimes has left me immobilized to action and shying away from the world around me. I'm left with only prayer and that action seems empty in the face of having positive effect on my surroundings. Recently I came across two things. One is the tapestry called Circle of Friends by Alice Beasley and the verses in Romans. 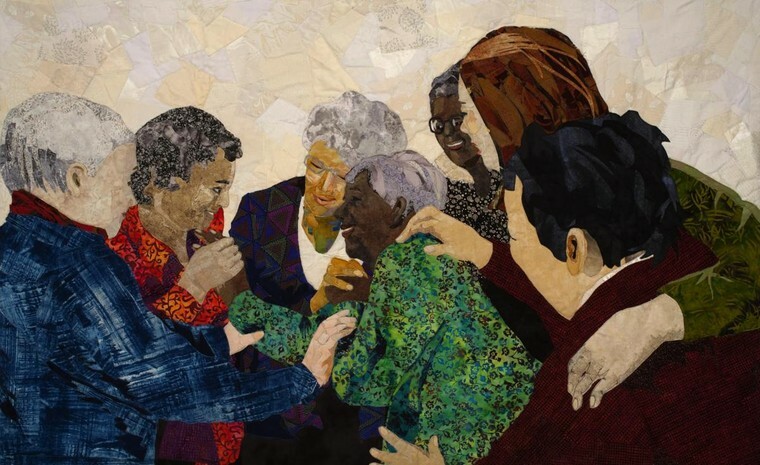 Alice Beasley is a textile artist that uses fabric to tell a story. She says that "I find color, light, shadow, line and value in the pattern of ordinary household fabrics. From these I snip small pieces that I arrange and fuse into a figurative composition". Once it is laid out in a picture story she will "fuse and sew it together to make it complete". The first tells me I don't have to have it all. I don't have to bring total healing or reconciliation to the situation. I just need to bring my color, my light, my shadows, my lines, and my values. My ordinary fabric. What I don't have, someone else will probably be there to bring theirs. If I'm a red, I don't need to be a green, I just bring the red that I am. If a green is needed, they may show up at anytime. This seems to give an opportunity for others to be involved with the task at hand. The second thing were the verses in Romans which talk of having a personal strength to be used, given, or to serve another in need. A strength that cares, teaches, corrects, and lifts up those who falter. It is a strength not to be hoarded, but to ask "How can I help". I have had opportunities in the past with shoveling someones snowy sidewalk, helping feed the homeless at a shelter, and to weeping with a father who lost his daughter to cancer. Lately it has come out of and through my paintings. To create and express beauty, fond family memories, and hope for something greater with the reds and greens in my hands. I think that everyone does have a strength to bring no matter how small they may think their strength is. Both these things help me see situations and people in a different light. So I have to ask myself on a regular basis, how can I help? Am I willing to be there for someone? Am I looking for those places where my strength can serve? I know I have a strength and color to give to the one who has faltered. How can I help. This morning I was taking my daughter Brittany to school. She goes to a private school and my wife Diane or I drive her since there isn't a bus to ride in our area. When I do it, I hope traffic is light without any accidents to hinder the drive. A normal drive takes the beltway around Baltimore and exits to some winding country roads that are single lane but very scenic. On the way there on one of these country roads we became 'stuck' behind a garbage truck picking up the trash. Normally its a bummer, but this day it was a treat. The truck would stop and the two guys on the back quickly jumped off and did their job. When they leaped back to the positions of holding on while the vehicle moved, the guy on the right started to wiggle and sway his hips to some song he was hearing. At one point he had "a hand in the air like he didn't care". Not a safe thing to do, but he was enjoying himself while working. This went on for several stops until the garbage truck turned off another road to continue their daily route. I asked Brittany " have you ever had a song in your head do that for you"? We both agreed that has happened to us to the point it didn't matter what people thought while watching us wiggle and sway to the beat. I continued to tell her it reminded me of a time in the Bible where a king was so happy with joy that he started to dance while clothed with just his under garment; his underwear in today's lingo. In the same story, his wife looked down on him because it didn't appear proper, right, and dignified. So I have to ask myself, how do I want to do the work that is before me? Is it going to be with a wiggle and hand in the air with happiness and joy or am I going to be concern on how someone may be looking at me? The garbage man was having fun doing his job removing trash form the road. Not a job I would first choose for myself. I would have to say its not about his circumstance but his perspective on hanging off the back of that truck. Its that song you hear in your head and in ones heart that helps the ride you are taking. Through smooth and bumpy rides in your life. Seeing scenic winding roads or potholes the song helps lift you up and after watching the garbage man, his song lifted me up for the work I have today. The 2017 year is quickly coming to an end at a time when I have had feelings of joy and apprehension. The joy was because the holiday season that brought out the decorations, foods, family time, and the celebration of my faith in the birth of the Savior. The apprehension was from the work of delivering package upon package as a driver for UPS. The normal road, or story, that I have taken did change in circumstance and direction. Early this year an injury through work lead me to therapy, surgery, and more therapy. During the time off I was able to take a moment to rethink what was next for me, especially in the terms of my time, family, and vocation. In the past, as some of you know, I have done fine art painting and my art was something that I called a “business” but only dabbled in when I had time. Now I found desires to have my creative gifts play a more prominent role. I joined art organizations locally and nationally for mentoring and community. Slowly I developed a greater perspective for making my artwork into a fruitful business. Part of that change was to retire from UPS after 29 years this past November. Working for ‘Brown’ provided well for me and my family, but it did take away time from the other things that I value. As the new year approaches, I am going into it with a new perspective and direction. I have a new job with a painting company that has opportunity for advancement and growth as well as clocking out at a reasonable time. This new job hopefully will give me time for C Irwin Design to become the fruitful business I desire and envision. The 2018 year will bring a new website to sell my art directly to the public, three series of paintings, and new venues for showing my paintings locally in Maryland. I hope this part of my story has enticed you to start or continue following my creative path in painting through my social media and website in the coming future. Have a Merry Christmas and a Happy New Year and may it be blessed.